These days my role as a marmot researcher has changed. 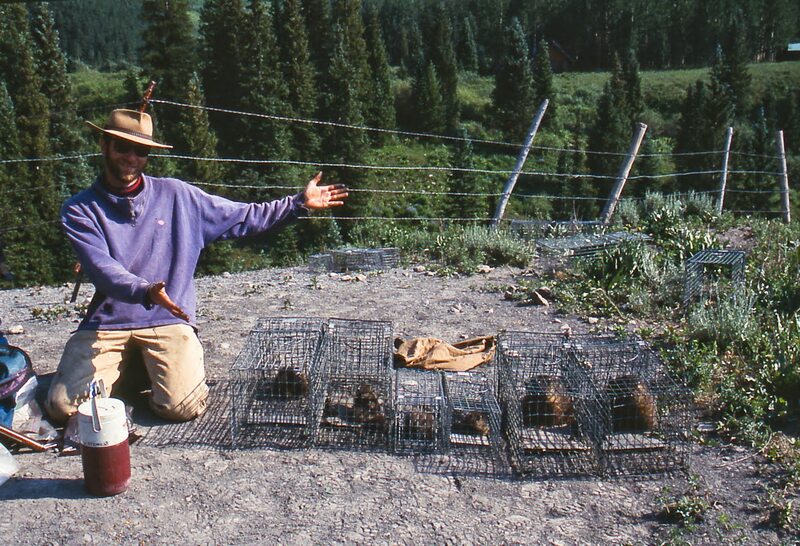 Whereas I used to spend most days collecting data in the field, I now spend a lot of time teaching others how to work with the marmots, conduct experiments, and I spend a lot of time troubleshooting new procedures, and a lot of time working with students showing them how to analyze data. An exception to this supervisory role is that when it’s pup season, all hands are required to quickly catch and mark pups before they become fox food! Trapping pups is fun and quite a challenge at times. It’s fun because they’re very cute and you can hold them (we keep adults in our handling bags to avoid getting bitten by them). It’s a challenge because in recent years around the Gothic Townsite, it really has become a race against the foxes! We set traps outside the marmot burrows and wait for the marmots to walk in but the foxes set up shop outside marmot burrows too. And they are amazingly effective predators! Foxes hunt by sitting quietly and waiting for a pup to emerge then, with an explosion of speed, they pounce on the pup, bite its neck and head, and kills it immediately. We’ve watched (we try not to interfere) entire marmot litters get killed and hauled off by adults to feed their fox kits within a few days of when the marmot litter has emerged. The sad thing is that some of the foxes are present around the Gothic Townsite largely because of human activities. Foxes, but not coyotes, can habituate—get used to human activity. Indeed, coyotes will kill foxes—an interesting phenomenon called ‘intra-guild predation’. A few years ago some winter caretakers fed the foxes and this led to the foxes sticking around, habituating to people, and allowing them to learn to specialize on marmot pups. I wrote an essay for the Denver Post about how the kindness of some can cause localized ecological disasters. For us, it just means a lot more effort into trapping pups immediately after they emerge. Which is a good thing for our long-term studies.